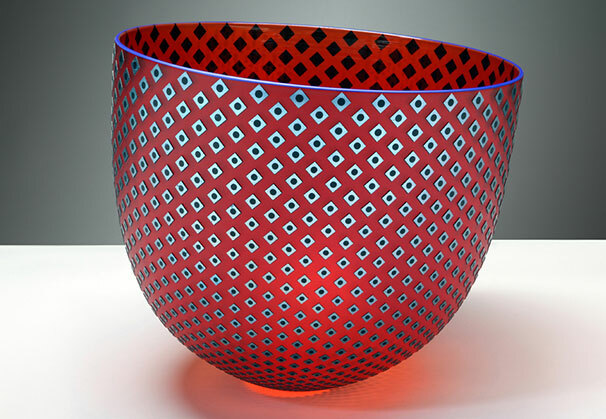 Australian born Robert Wynne studied visual arts at Monash University, majoring in ceramics before completing a master’s degree in glass at California State University. 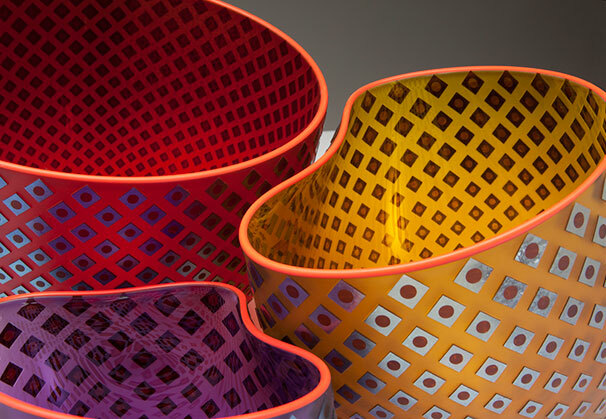 Wynne draws inspiration from painting, ceramics, sculpture, the Surrealist movement, and early 20th century French glass. The textures and colors of the Australian landscape also appear throughout the work. Wynne is represented by Kirra Galleries, Melbourne, Australia. My work portrays contrasting impulses within. I love the challenge of technical precision but I need to be able to play and explore. I enjoy making beautiful objects but I am not afraid to create pieces that evoke emotions more complex than just aesthetic appreciation. In some ways I’m an anarchist; I’m not happy when things are just comfortable. I am restless, always looking for an angle, and this is reflected in a body of work that is quite diverse. Having said this, there are common threads running through my work. I love the gorgeous glow of light through frosted glass and have a fascination with lustrous, iridescent finishes; particularly with the way that light is manipulated, reflected, and transmitted. 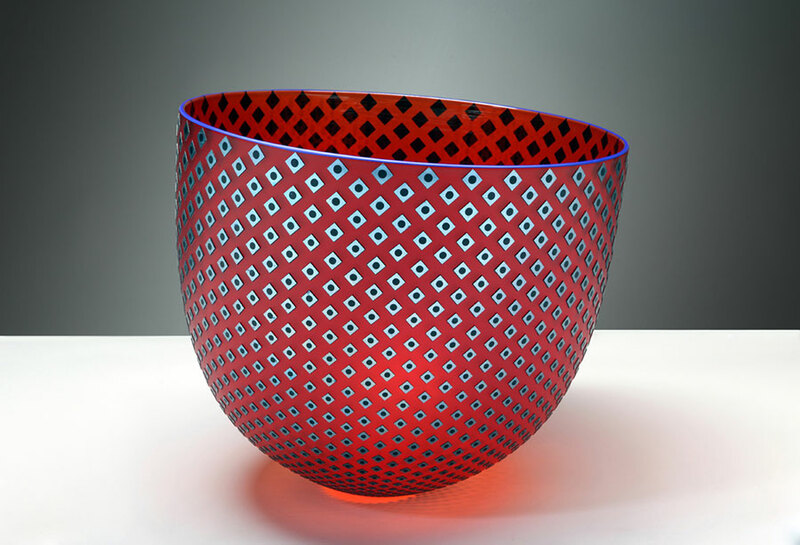 I take inspiration from a broad range of influences including historical glassmaking practices and formal sculptural dialogue. My recent work featuring the raven and other birds engages with themes of desire, the fragility of wealth and the concept of security. 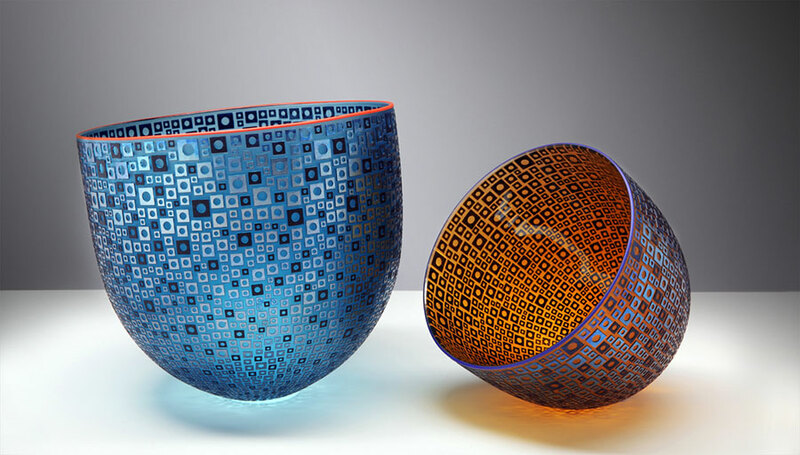 Robert Wynne graduated from Monash University Gippsland in visual arts with a degree in ceramics and a post graduate diploma in glass. 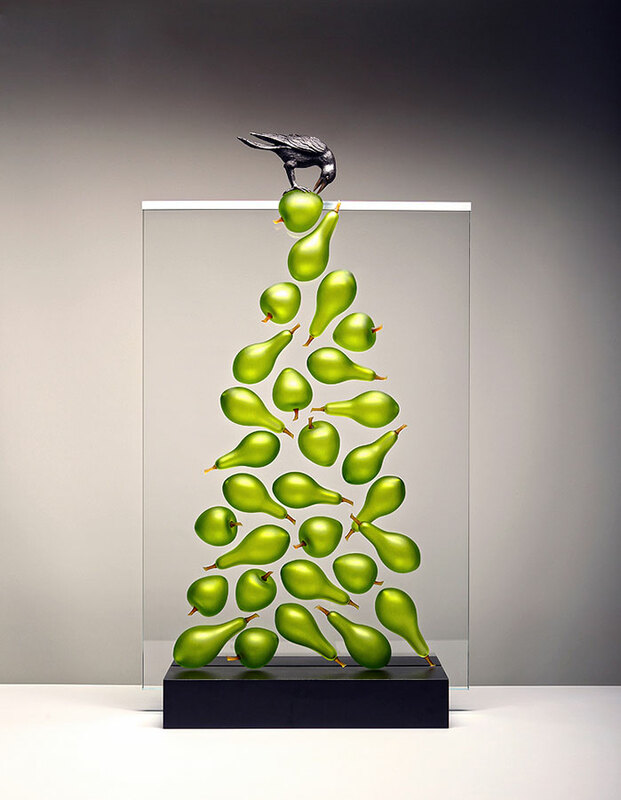 During this time he was taught by glass pioneer Nick Mount and worked in his studio as an assistant. To further his studies, Wynne was awarded an Australia Council Grant to study for his Master of Arts at the California State University’s Chico campus in northern California. 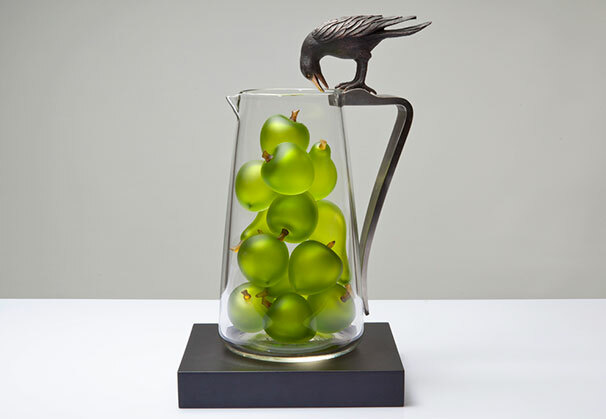 By the ‘90s, Wynne had established the Denizen Glass Design Studio in Manly, Australia, his own business, renowned today for its professionalism and highly individual work. 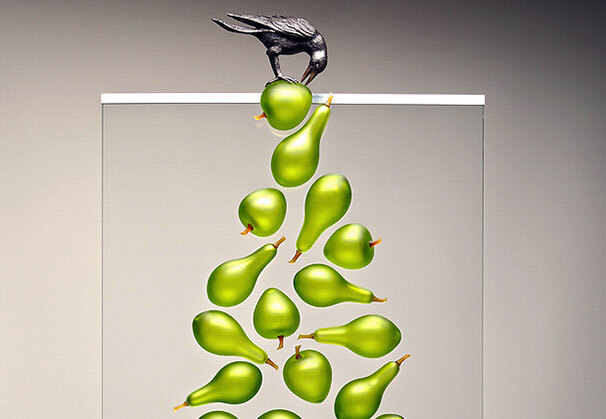 Forever working to expand opportunities for emerging glass artists, Denizen Glass Design Studio has also provided a professional workplace which has allowed many glass artists to nurture their careers – Matthew Curtis, Richard Whiteley, Ben Edols and Kathy Elliott, and Bettina Visentin, all of whom are now successful in their own right. 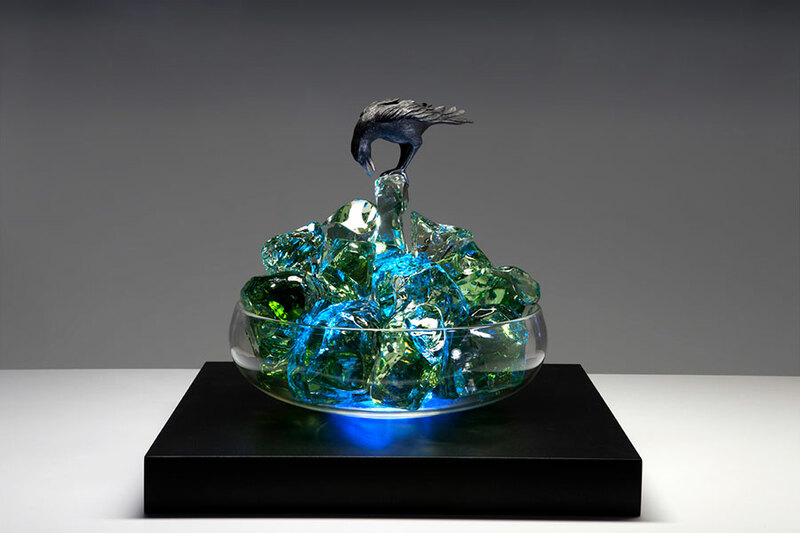 Committed to researching new and exciting ways of working with glass, Robert is constantly pushing the boundaries and in doing so, provides a fresh challenge for audiences and collectors to enjoy his innovative and accessible pieces. His work is featured in galleries around Australia and the world; in prominent public and private collections including the new Parliament House in Canberra, the Powerhouse Museum in Sydney and the private collections of President Bill Clinton and Sir Elton John among others. 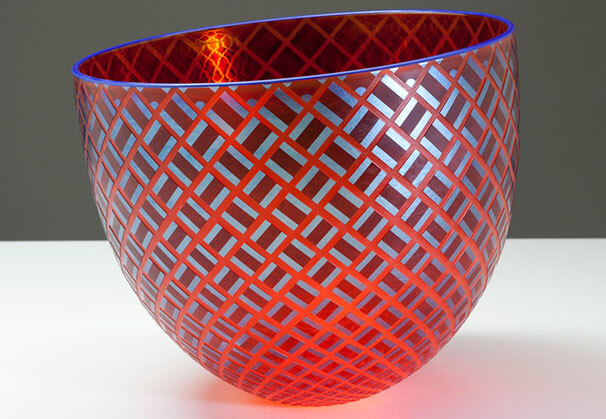 It’s all very well to say that glass is a seductive material and that is carries light, but what we really want to know is what people do with that seductive material to better play with its light carrying properties. If, for instance, we simply blow and mold clear crisp objects, we reach a point where we simply repeat the familiar. 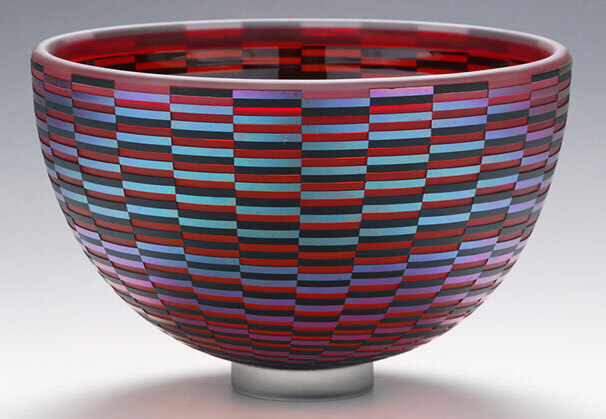 Thankfully, new colors are being invented all the time, but that again has its limitations unless we find occasionally an articulate color master such as Dante Marioni who is capable of combining those colors in such a way as to extend our appreciation of how color and the light carrying properties of glass interact. 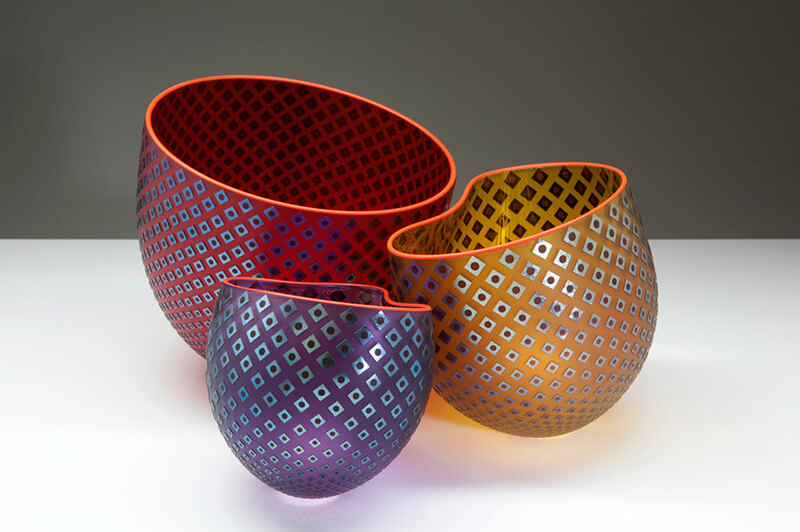 Robert Wynne has taken a traditional technique, pioneered by Tiffany and others, and utilized it in contemporary pieces which extend our understanding and appreciation of the possibilities in glass. While claiming to be influenced by the work of the Californian studio Orient and Flume, his work is in fact nothing like theirs. There are a number of studios worldwide that specialize in this Californian Nouveau funk with its iridized lily motifs and the dragged and combed linear effect of wrapped lines, reduced in silver salt atmospheres to create silvery art nouveau paperweights and vases, but thankfully, Wynne’s is not one of them. 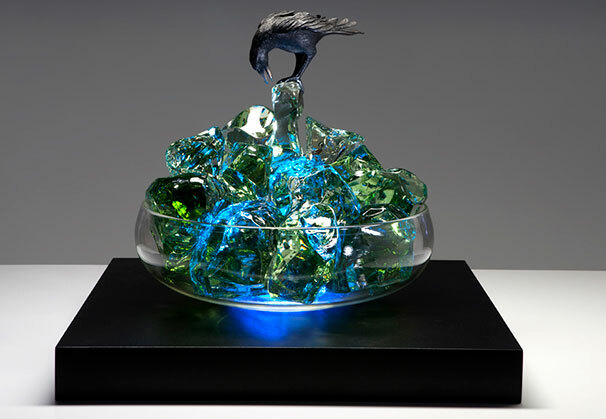 Wynne refers to Art Nouveau by using the traditional technique of silver impregnated glass frit around the piece which he then reduces to create iridized color. 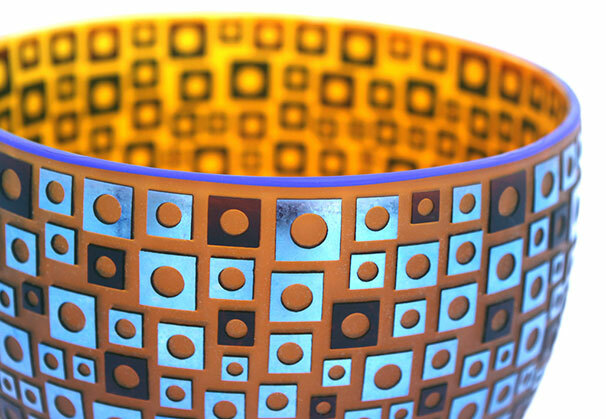 It is a form of overlay which depends on a chemical reaction to iridize the outside of the piece. What Wynne then does with the piece is what makes his work distinctive and of great interest; he removes most of the casing! The technique involved here is quite simply sandblasting. But sandblasting, for all its simplicity also adds to the light carrying properties of glass by diffusing the light and removing the reflective component. What is left is purely transmitted light. 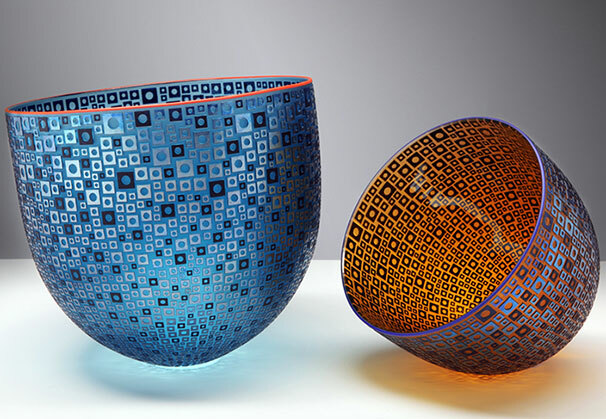 In Wynne’s pieces it is transmitted light juxtaposed against highly reflective opaque glass patterns and shapes. 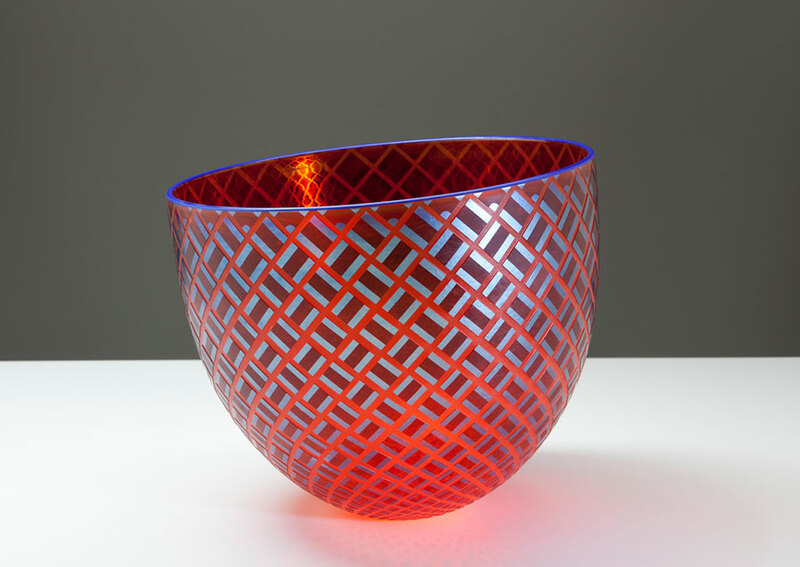 This is important in understanding the real qualities of Wynne’s work, gbecause if there is one great failing with iridized glass, it is that the iridizing process renders the glass opaque and destroys all of its light carrying properties; we might just as well therefore use metal instead of glass. 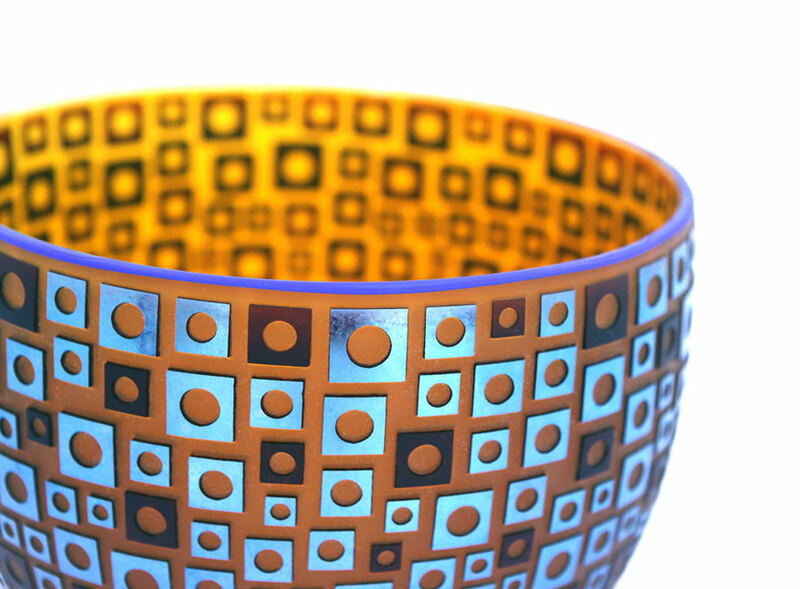 Take Wynne’s “Shima” Bowl for example, created with his partner, Yuri Wynne (Yanai). He chooses a rich translucent red as a base flashed color. 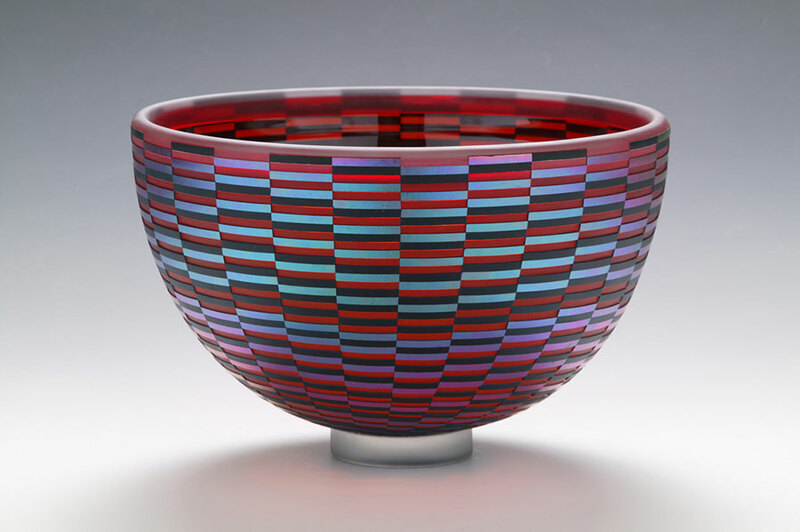 That is, he lines the inside of the bowl with a transparent red. He then cases the outside of the both with another color and iridizes it, effectively giving the bowl three layers of color. He then sandblasts through the iridizations to reveal the cased color and then through that cased color to reveal the translucent red. The effect is that the iridized color reflects a greater amount of light than the transparent color transmits and confuses the viewer into believing that all of the colors sit on the one plane and so they “dance” before our eyes; fighting as it were for priority in our vision. The effect is that of shimmering. In order to have achieved this, Wynne has had to study the behavior of glass. Iridization depends on millions of tiny crystals reflecting light in the same way as mother of pearl does. Sandblasting is a form of faceting which diffuses the transmitted light and equates strongly with the qualities of iridized glass. Robert Wynne is a master when it comes to light. 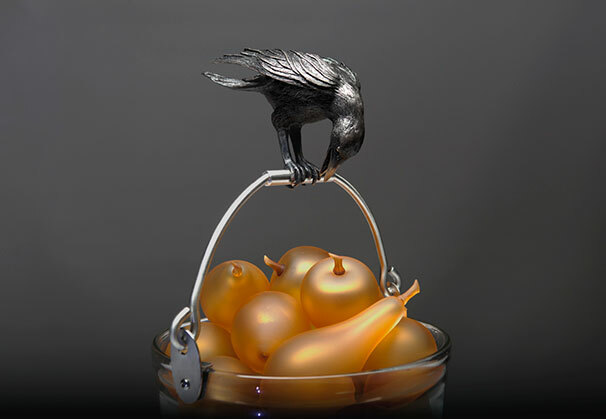 In a career now spanning 40 years, his most recent work now incorporates bronze sculpture and specifically bronze birds; ravens and bower birds. 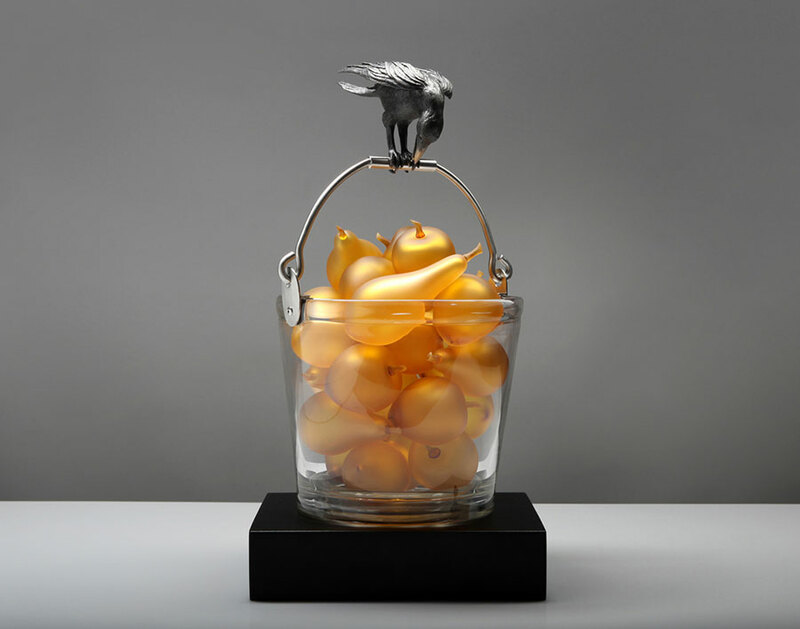 These serve not only to extend the work visually but poetically as well. The raven, noted for its intelligence and ability to collect, carry, and “play” with objects and the bower bird for its habit of collecting objects to adorn its habitat might be seen as metaphors for us, the “collectors” of fine and beautiful objects. 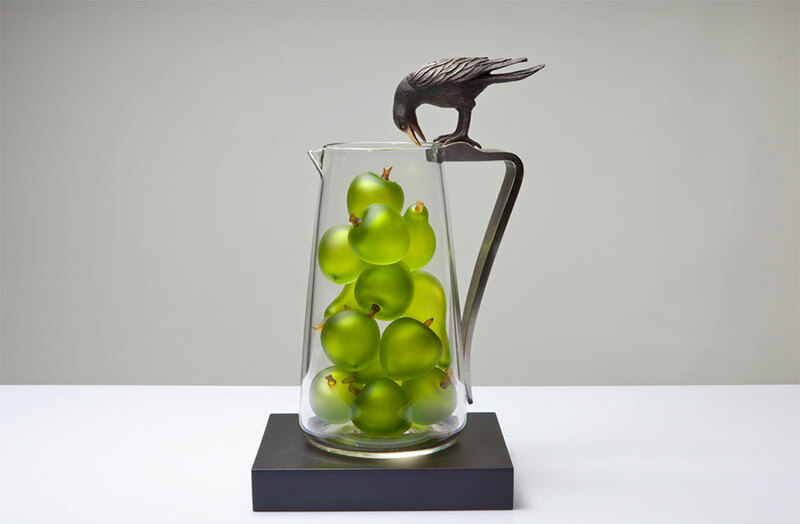 In this regard, Wynne has hit upon an absolute gem with his astute juxtaposition of the intrinsically seductive nature of glass with the highly esteemed finish of bronze. 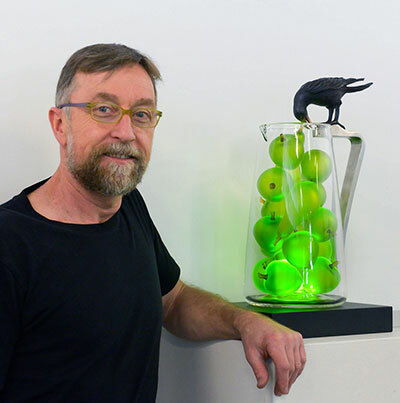 Robert Wynne is now one of the old boys of Australian Glass with a unique style which marries the traditional with the contemporary; which juxtaposes the highly reflective with the translucent and which is loaded with visual pun. Beneath the finesse and clarity of design, Wynne’s work has undergone regular rigorous beatings with hours of messy experimentation, pieces are bashed around on the marver, cut into jagged bits and reheated and pulled and twisted agonizingly. What we see happening in his studio is a far cry from the finished product but through it all, his pieces retain their sense of fun. These are happy pieces. Brightly colored gourds and polka dots, crucibles decorated with patterns of broken shards of glass, some unable to stand along without the aid of supports and others seemingly top heavy, listing to one side as if about to tumble, they “play” with notions of fragility and gravity. They possess a kind of wit. We are grateful to Kirra Galleries, Melbourne, Australia, for providing the Artist of the Month.